The ERC (European Research Council) last month celebrated its 10th Anniversary. Judging by the speeches and conversations on the day, ranging from Commissioner Moedas and President Juncker to the ERC’s many grantees, it seems to be widely considered as rapidly to have become a success story and is highly regarded. Its philosophy is simple – and in stark contrast to the UK’s Research Councils’ – with excellence as the sole criterion when judging applications. Many events were held around Europe – and indeed beyond its borders – to celebrate the tenth anniversary, and a brief video of the central celebration held in Brussels on March 21st,, which I attended, can be seen here. I am now in my fifth year as a member of the ERC’s Scientific Council, the committee that has ultimate oversight of the ERC’s operation. My first meeting, when I was merely an observer and strictly not yet permitted to disclose my as yet unapproved membership, was held in Erice in 2012 (I described reflections arising from this visit to Sicily here, although not the motivation for it) . This week I have been back in Italy with the ERC, this time in the equally beautiful and historic city of Padua, and I have enjoyed having a little time in the margins of the meeting to explore this attractive city. Unusually for me I’m posting a few photographs to illustrate some of the academic attractions of this city taken during a brief guided tour of the Palazza del Bo where our meeting was held (and I know I’m no photographer). 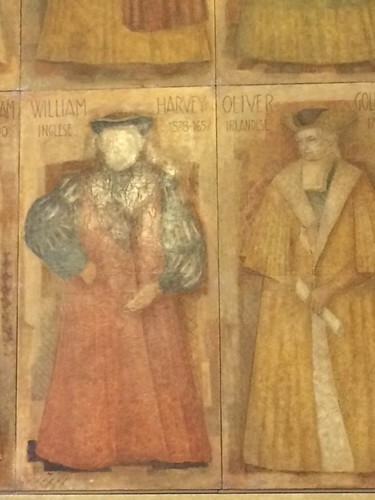 William Harvey, shown here in a prominent painting on the university walls, studied anatomy at the University of Padua, which right from the start had attracted many international students. He attended at a time when it already had both a significant reputation in the field as well as the word’s first anatomy theatre. I had read about this theatre in a biography of Harvey by Thomas Wright and seen an image of it in the book, but I had somehow imagined it to be much bigger than it transpires to be: its central cavity is really only large enough to accommodate the dissection table and the professor walking around it. It is nevertheless an impressive construction (slightly modified since Harvey’s day, but still largely original) allowing space for over 200 students to stand and watch a dissection take place. 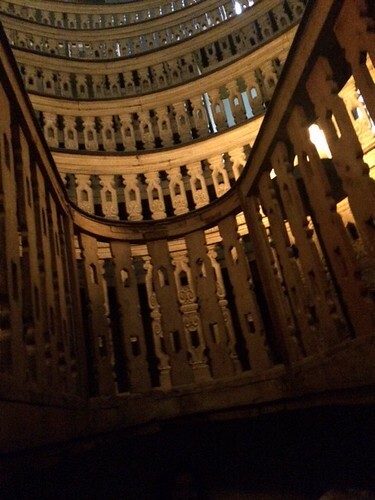 Standing at the bottom of the theatre in its current form, photographing the tiers of wooden balustrades reaching up to an overall height of 14m (shown above; they presumably helped to stop students overcome by the stench and sight of blood from falling down into the central well), it is hard to give a true impression of the size and beauty of the construction in this photograph. The university also saw the first female in the world to graduate back in the 17th century, although she wasn’t actually allowed to attend lectures in the university along with the men, but was instructed privately at home. The deal for Elena Piscopia was that she could not study theology but had to study philosophy (as being more appropriate for a woman) and also that the conditions imposed meant explicitly that future women were debarred from following in her footsteps. 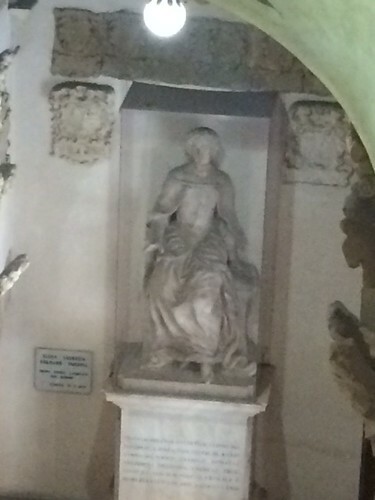 A statue in the university commemorates her. However, coming here, and indeed in attending all the ERC Plenary meetings of the past year, is very bittersweet. I think I first noticed it when I went to Dublin last autumn: I now feel like an impostor in a European city. I have been, it would appear, stripped of my European citizenry. Hence now it is hard not to think of myself as ‘not belonging’, an outsider. I am of an age that can still remember crossing borders within Europe before we joined the EU, when passports had to be shown at every border guard outpost. My late mother, like so many of the generation that had lived through the 2nd World War, believed that the EU was an insurance against a third such war. The integration of Europe that has proceeded over the past 40 years has opened up opportunities in myriad ways. The involvement of the UK in the ERC is just one small but non-negligible aspect of this. I dream that we will still be able to find a way to ensure scientists in the UK can continue to access Horizon2020 and subsequent programmes from the EU; to make international students and scientists feel the UK is an attractive destination and place of work or study; and that we will be able to ensure that science remains open and international, for which national boundaries do not introduce mental and scientific boundaries. The last, it seems, can no longer be taken for granted in various parts of the world. I personally will be doing all I can to try to find a way to achieve continuing access to European science for researchers in the UK. But I look at my Twitter profile photograph and wonder at what point I should remove my aspirational ‘Scientists for the EU’ twibbon. The opinion polls give me no hope that in 7 weeks time it will have relevance once more. Spending time with the ERC just reminds me of what the UK, collectively and not just scientists, are losing. This entry was posted in Science Culture, Science Funding and tagged Brexit, Elena Piscopia, ERC, William Harvey. Bookmark the permalink. Thank you for this perspective. As a non-British EU PhD student studying in the UK, I have a recently had a strong feeling of ‘not belonging’. Even so no one I personally interacted with has made me feel unwelcome since my arrival a year and a half ago, I don’t really feel welcome in the UK. I had not fully settled in, when the campaigning for the Brexit referendum started. The disdain and hate against immigrants that were voiced during the campaign alienated me. Whenever I walk by a newspaper stand, I see headlines against immigrants and wonder when this negative attitude will start to directly impact on my life. The Brexit vote has added a lot of uncertainties to my life. How long will I still be allowed to use the NHS? Will I need a work visa to do a PostDoc here? Will I have to pay higher student fees? The aftermath of the Brexit vote has left me wondering if I am welcome and valued in this country. Increasingly my opinion of the UK is declining because I had to realize that I am not welcome and the UK’s leading politicians make a point out of stirring resentments against immigrants for their political gain.